for a mailer promotional item. The "Advertising Ruler" has a larger imprint area. English and Metric scales printed in black. Edges are slightly beveled. 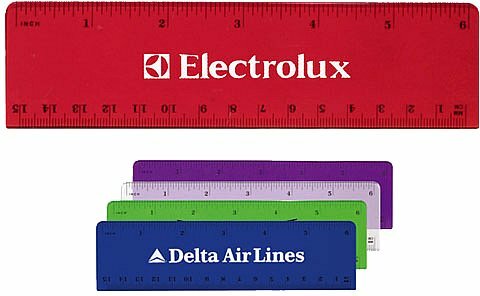 Ruler Translucent Colors: Red, Blue, Green, Clear and Purple. Overall ruler size is 6 1/4" wide x 1 1/16" high x 3/32" thick. Delivery from date of a plastic ruler order is 2-3 weeks. Price includes a one color imprint up to 5" w x 3/4" h on one side. add a setup charge and a running charge of $.25 each unit.